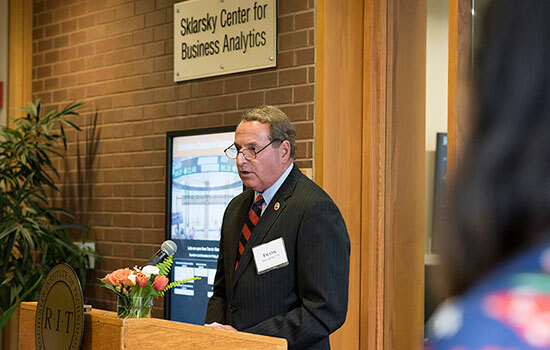 The Sklarsky Center for Business Analytics was named for alumnus Frank Sklarsky â€™78 and his family. Rochester Institute of Technology alumnus and trustee Frank Sklarsky and his family have made a gift to Saunders College of Business that will benefit students for years to come. The endowed gift helps support costs associated with the Sklarsky Center for Business Analytics, a 800-square-foot space to the right of the entry to Saunders College that was formally dedicated at a ceremony on May 4. The gift will provide funding for equipment purchases and software, as well as student activities, lectures and research projects associated with the Sklarsky Center. The center has an electronic ticker streaming real-time market data, mounted flat-screen TVs, wireless connections, and information services and research tools that support collaborative and project-based learning. Students can work independently or in groups 24/7 to use the technology to build investment portfolios and analyze the fluidity of stock prices on Dow Jones or Nasdaq, just like professional financial analysts do. Bloomberg terminals and associated software, in conjunction with a suite of analytics software, provides real-time data from every market, breaking news, in-depth programming and research capabilities, and powerful analytics and data-visualization applications that equip students with industry-standard tools. Sklarsky, who was named an Outstanding Undergraduate Scholar, graduated in 1978 with a degree in business administration accounting. He began his professional career as a certified public accountant for Ernst and Young before earning his MBA from Harvard Business School. He worked for Chrysler, where he was employed for nearly 20 years and met his wife, Ruth. Following a brief stint at Dell in Austin, Texas, he returned to Daimler Chrysler as vice president for finance. Following that, he spent two years as chief financial officer for Con-Agra Foods in Omaha, Neb., and then returned to Rochester, N.Y., as Eastman Kodak’s chief financial officer. He also worked for Tyco International and completed his career as executive vice president and chief financial officer of PPG in Pittsburgh, retiring in 2017. Last year, Sklarsky and his wife, Ruth, funded an endowed scholarship that provides tuition support for undergraduate students in STEM disciplines. Maksim Shchegelskii, a graduate student in finance from Russia, knows first-hand the impact of this business analytics center. He used the software housed within the lab to analyze oil markets for a project. Saunders Dean Jacqueline Mozrall spoke during the dedication ceremony.